We offer a range of investment strategies available in customized, separately-managed accounts, private investment funds, collective investment funds, and mutual funds. Some investment products are available only to certain qualified investors and plans. 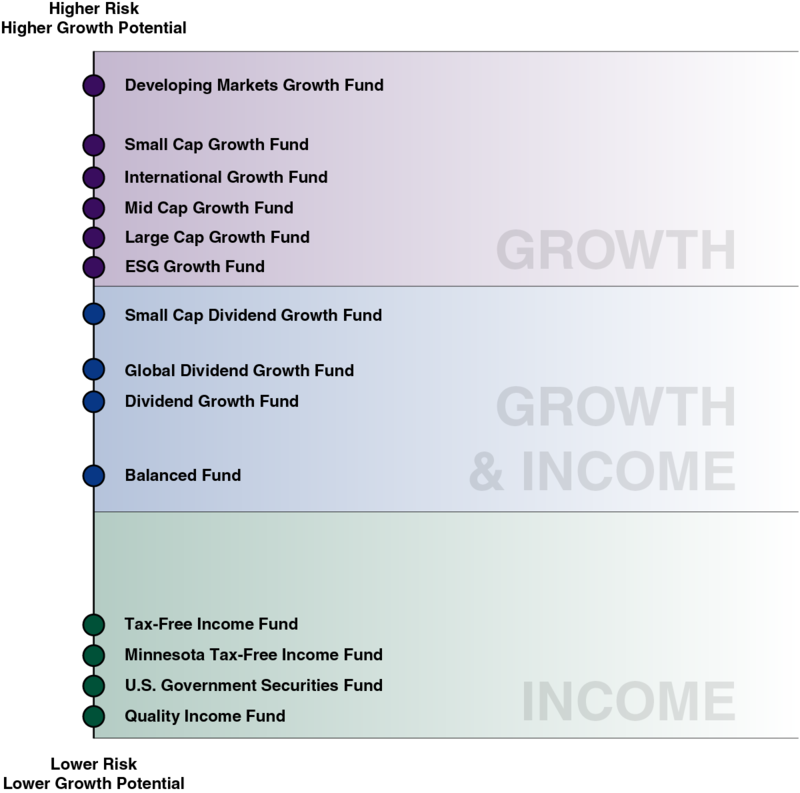 1) Global Dividend Growth separately managed account strategies include Global Dividend Growth and Concentrated Global Dividend Growth. 2) International Growth separately managed account strategy includes EAFE+ Growth. 3) Taxable separately managed account strategies include Taxable Total Return, Taxable Intermediate Duration (U.S. Gov’t), Taxable Intermediate Duration (Gov’t/Corp. ), Taxable Short and Return Plus. 4) Tax-exempt separately managed account strategies include Municipal Total Return, Municipal Intermediate Duration, Municipal Short Duration and Municipal 7 Year. Interests in the private investment funds are offered to a limited number of institutional and other sophisticated investors who qualify as “accredited investors” as defined in Rule 501(a) of Regulation D of the Securities Act of 1933. This information does not constitute an offer to sell interests in any fund, nor is it intended to invite or permit the making of offers to purchase interests in a fund. Many restrictions that are customarily adopted by mutual funds have not been adopted by the private investment funds. The funds are not intended to present a balanced investment plan or a complete investment program. There can be no assurance that a fund will achieve its objectives, and a fund could have substantial declines in the value of its portfolio securities. Separate accounts managed by Sit Investment Associates and its affiliates require a minimum account balance, generally $10 million dollars. Information regarding fees is included in Sit Investment Associates’ form ADV Part 2. Common stocks of domestic growth companies with capitalizations of $5 billion or more at the time of purchase. Common stocks of domestic growth companies with capitalizations of $2 billion to $15 billion at the time of purchase. Common stocks of domestic growth companies with capitalizations of $3 billion or less at the time of purchase. Common stocks of dividend-paying companies that exhibit the potential for growth and growing dividend payments. Common stocks of dividend-paying companies with capitalizations of $3 billion or less at the time of purchase. Investments are concentrated in a relatively small number of publicly traded securities. Common stocks of growth companies domiciled in countries included in the Morgan Stanley Capital International EAFE Index, and up to 20% of the portfolio’s assets in companies and countries not included in the EAFE Index. The “+” in EAFE+ consists primarily of developing markets (such as Korea and Israel) and developed markets (such as Canada). Common stocks of growth companies domiciled in both the developed Pacific Basin markets (such as Japan), as well as the emerging growth markets in the Pacific Basin (such as Korea, Taiwan, and the greater China region). Common stocks of U.S. and foreign dividend-paying companies that exhibit the potential for growth and growing dividend payments. Invested in a relatively small number of common stocks of U.S. and foreign dividend-paying companies that exhibit the potential for growth and growing dividend payments. Closed-end bond funds with a duration range of 3 to 6 years. Investment-grade taxable bonds with a duration range of 3 to 6 years. U.S. Government securities and investment-grade taxable bonds with a duration range of 2 to 5 years. U.S. Government securities with a duration range of 2 to 5 years. Investment-grade taxable bonds with a duration range of 1 to 3 years. Investment-grade municipal bonds with a duration range of 5 to 10 years. Investment-grade municipal bonds with a duration of approximately 7 years. Investment-grade municipal bonds with a duration range of 3 to 7 years. Investment-grade municipal bonds with a duration range of 1 to 4 years. Diversifed portfolio of stocks and bonds. Fixed income and equity closed-end funds. Many of the strategies used in the management of our separately-managed accounts are available in the Sit private investment funds. The investment advisor of the Sit private funds is Sit Investment Associates, Inc. or its subsidiary, Sit Fixed Income Advisors II, LLC. Interests in the private investment funds are offered to a limited number of institutional and other sophisticated investors who qualify as “accredited investors” as defined in Rule 501(a) of Regulation D of the Securities Act of 1933. This information does not constitute an offer to sell interests in any fund, nor is it intended to invite or permit the making of offers to purchase interests in a fund. Many restrictions that are customarily adopted by mutual funds have not been adopted by the private investment funds. The funds are not intended to present a balanced investment plan or a complete investment program. There can be no assurance that a fund will achieve its objectives, and a fund could have substantial declines in the value of its portfolio securities. Investing involves risks. Information about the qualifications and business practices of Sit Investment Associates, Inc. is available in its Form ADV Part 2A, available by contacting Sit Investment. Several of the strategies used in the management of our separately-managed accounts are available in the Sit Collective Investment Trust. Investing in the Sit Collective Investment Funds is limited to certain pension, profit sharing, defined benefit, and other qualified retirement plans. Sit Short Duration Bond Collective Investment Fund, Sit Bond Collective Investment Fund, Sit Opportunity Bond Collective Investment Fund, Sit Small Cap Dividend Growth Collective Investment Fund and Sit Large Cap Dividend Growth Collective Investment Fund (the “Funds”) are each funds of the Trust. The Funds were established, and are managed by Global Trust Company (“GTC”), the Trustee of the Trust, which is a wholly owned subsidiary of Northeast Retirement Services, Inc. of Woburn, Massachusetts. GTC is organized as a Maine state-chartered non-depository trust company and, as such, it and the Funds operate in conformity with the rules and regulations of the Maine Department of Banking as they apply to collective investment of fiduciary funds. Sit Investment Associates, Inc. is the Funds’ investment adviser (the “Adviser”). Sit Mutual Funds are managed by Sit Investment Associates, Inc. The Sit Mutual Funds are offered by prospectus only and sold only to persons residing in the United States. This information does not constitute an offer to sell or a solicitation of an offer to buy shares of any Sit Mutual Fund. Investing involves risks. For more information about Sit Mutual Funds please visit our Mutual Funds website at www.sitfunds.com. Carefully consider the Fund’s investment objectives, risks, charges and expenses before investing. The prospectus contains this and other important Fund information and may be obtained by calling Sit Mutual Funds at 1-800-332-5580 or at www.sitfunds.com. Read the prospectus carefully before investing. Investment return and principal value of an investment will fluctuate so that an investor’s shares when redeemed may be worth more or less than their original cost.